Composed of nobility and commoners alike, these men can fight equally well on horseback, or on foot. Well protected in their plate armour, and armed with swords, they are a tough fighters, whether on the offence or defence. Although extremely effective, they nevertheless don't quite have the elan of true knights. A Master Armourer substantially improves the armour available to new and retrained units. 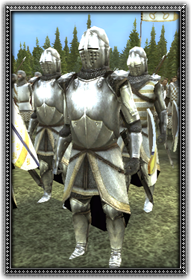 An Armour Factory provides the highest quality of armour to new and retrained units.